Overview: Reishi is a parasitic fungi that occurs on living conifers (especially eastern hemlock and western hemlocks) and saprobic on the deadwood of conifers. Ganoderma means having a shinyor lustrous skin; tsugae means hemlock (Tsuga). Ganoderma tsugae is closely related to Ganoderma lucidum and the two are virtually indistinguishable from one another on the basis of physical features alone. However, Ganoderma tsugae is partial to conifers, especially hemlocks and firs; Ganoderma lucidum is found on the wood of hardwoods. 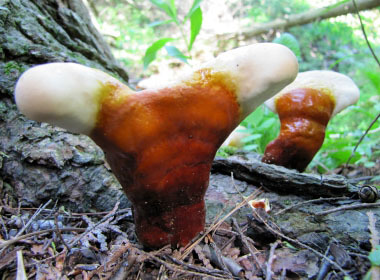 Distinguishing Features: Reishi has a bright, white, outer growth margin while growing. As growth continues, the margin may begin to change colour and develop a tough skin that has a shiny lacquered appearance. 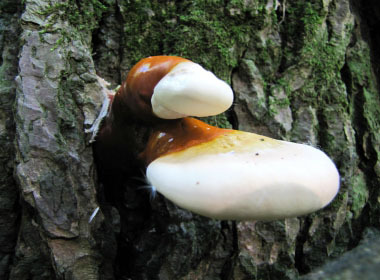 Ganoderma tsugae has whitish, rather than brownish flesh (Ganaderma lucidum is brownish). Both species are recognized by its shiny reddish to brownish-orange varnished cap and stem. It has a white margin; concentrially furrowed; surface becomes dull when coated by deposited spores. Caps measure 5 to 30 cm. 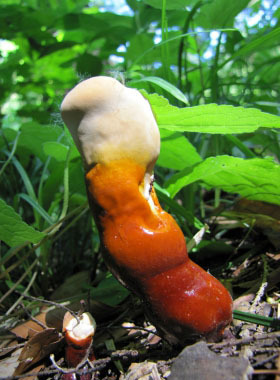 Height: Being a bracket fungi, reishi does not develop height. It's cap typically can reach cm in diametre. 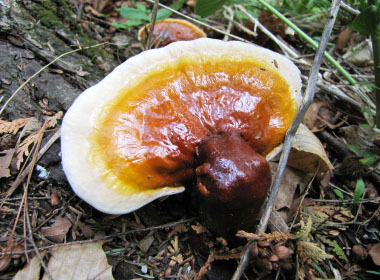 Reishi typically has a stem; 3 to14 cm long; up to 3 cm thick; it has a varnished appearance and coloured like the cap. 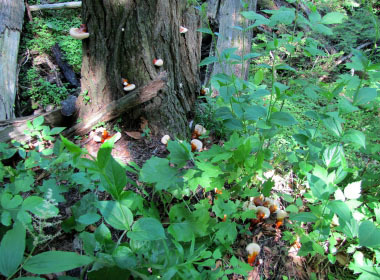 Habitat: Reishi grows on dead or dying eastern hemlock. It may also grow on other conifers beginning in late May or early June. It can continue to grow well into earlly autumn. One clue in locating an eastern hemlock tree is to see if any woodpeckers have been busy on the tree. Ganaderma tsugae will grow on the same tree for several years. Ganaderma lucidum grows in a similar fashion on hardwoods. They are widely distributed in North America where hemlocks occur, and occasionally reported from the Southwest U.S.
Spore print: Brown spore print. Season: Typically late summer into the autumn is when they reach full maturation. When a young specimen is found, it is good to know that it may take several weeks for the fruit to reach full size. Gills: Not applicable. Spores are released through tiny pores on the underside of the mushroom rather than gills. Pore surface is whitish, becoming brown in age or when bruised; pores measure 4 to 6 per mm. Edibility: This is not a fungi that can be eaten unless it is broken down then powdered. Then it can be used in a variety of meals, desserts and smoothies. Once broken into smaller pieces, it can be used to make tea. A big thank you goes to my dear friend Colleen Wiebe for providing all the reishi images. Please subscribe to her nature videos at YouTube.